A bit disappointment of MakeMKV since no right to choose Blu-ray chapter and can not direct output mp4 format? This article solve your problems. MakeMKV is a software app which shreds the copy protection on a disk, provides you with each file it finds, and when you have made your selection, it makes a nice beautiful MKV file, with perfect picture and sound quality. You can then play it with your favorite media player. The software is available for Windows, Mac OS X and Linux. It’s really Easy-to-use: Choose whether you want subtitles or not. Choose your language. Deselect everything you don’t need. Then let MakeMKV do its work. Commercial Blu-ray has copy protection than any other format around, open-source Handbrake doesn’t work for ripping Blu-ray because it can’t handle copy protection. The best way is choosing a Blu-ray tool that can directly rip Blu-ray MP4. There are so many Blu-ray Ripper on the market, many of them can be rip Blu-ray, but for ripping Blu-ray to MP4 directly with the chapter you want, Brorsoft Blu-ray Ripper is one of best I recommended here. As one of the best MakeMkv alternative, it enables you to remove Blu ray AACS encryption, region codes, BD+ and even any MKB copy protection prefectly. Apart from ripping Blu-ray to MP4, Brorsoft Blu-ray Ripper has ability to rip Blu-rays to other common format like MOV, WMV, FLV,ect. And you can select the preset format for your devices like Andorid Phones, Apple devices, Game consoles, NLEs. Worth to mention here, you can select the chapters you want to rip and cut the chapter you selected with the built-in editor in this program. 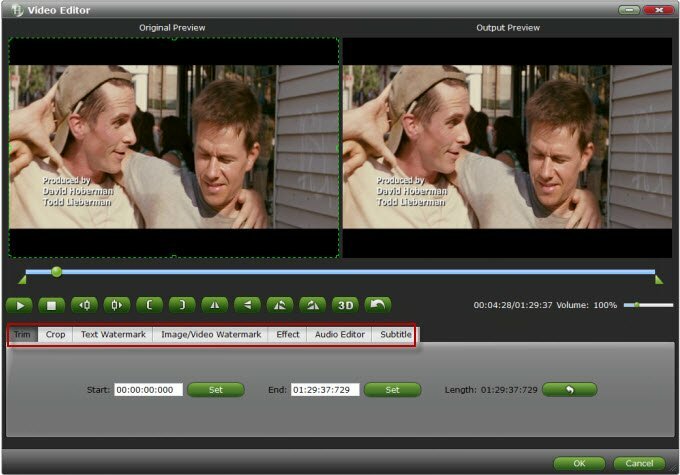 Bulit-in Editor functions: trim video length, crop video size, adjust video effect, watermark, and merge several videos into one for complete enjoyment etc. Even if you can select the “3D Video” profile enable the 3D/2D Blu-rays to 3D MP4,3D MKV, 3D WMV, 3D MOV, 3D AVI for watching on your big screen TV if your TV supported 3D outputs. Free download, install and run Brorsoft Blu-ray Ripper, the trail-before-purchase quick download icon provide here, you can also turn to Brorsoft page for downloading. 1. Import source Blu-ray/DVD movie. After downloading and installing this Blu-ray Ripper, click “Load files” icon to import source files. When the whole Blu-ray imported, you can select the chapters you want to rip. After load your Blu-ray, in the dropdown list of Format menu, you can find the format you like. Just below Format is Output, here you can browse your computer for a better destination folder for Brorsoft Blu-ray Ripper to output your ripped movies. Here we take “HD High Profile Video (*.mp4)” for example, which is compatiable with almost all meida player and devices. 3. Cut the Movie clips you want. Before conversion, you can edit videos by applying effects, trimming, cropping, adding watermark, adjust brightness and contrast, etc. Trim here, other functions tutorial please turn to Brorsoft Tutorial Page. 4. Just start ripping your Blu-ray movies by hitting the ‘Rip’ cion. After clicking the Rip icon on main interface, then you turn to Conversion window. When the conversion finished, you can click Open output folder to popup output directory with the converted files. You can select “shut down computer after conversion” so that you don’t need to stay with your pc/mac at night. Note: If you are using a trial version, there will be Brorsoft logo watermark in the middle of output files. To get rid of the logo watermark and get better performance, please Get the Full Version(click “order” button on the trail version splash screen or direct purchase from Brorsoft site). Brorsoft Blu-ray Ripper is not only an Blu-ray Ripper, But also an excellent DVD ripper, in a similar way, you can rip all the DVDs follow the above step-by-step guide. DVDs are very fast (normally no more than 20 minutes) and Blu-Rays range from 30 minutes to a couple of hours, depending on the length of the movie, and the extras you want.